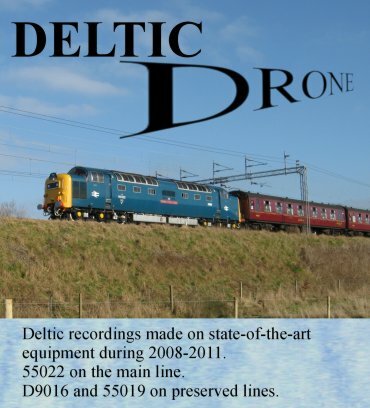 Deltic recordings, both main line and preserved railways. Recorded during 2008 to 2011. ** 55022 tackling the Lickey on 3 occasions, each one quite different. ** 55022 at Burton Coggles (twice). ** 55022 (night-time) at Holme Fen with an eerie silence so quiet that you can pin-point when the drone comes into hearing range. ** 55019 having a two-engine blast at the Great Central. ** In D9016's cab at Peak Rail on a goods train. 1 - 55022 passes on the down slow at 1004hrs with "The Norseman" railtour (Kings Cross-Newcastle). It was signal-checked and eased off shortly after passing. 47760 dead on rear. 2 - a) Bird-scarers fire as 55022 is heard approaching, faintly, on full power, down-wind. - b) 55022's power is shut off and the tour ("The Royal Scots Grey") trundles passed at 0959, with 57601 idling at the rear. It's heard coasting into the distance prior to a stop at Stoke. Weather conditions were overcast, misty, and beginning to drizzle during the recording. 3 - a) A pair of owls call to each other in the woods. - b) Heard from 300 yards from the level-crossing, along a footpath. A car fades into the distance and then the crossing barriers drop. 55022 has just departed Peterborough, and it is so peaceful and sheltered that you can pin-point the moment that the Deltic drone becomes audible. Geese and foxes are also heard in the distance. 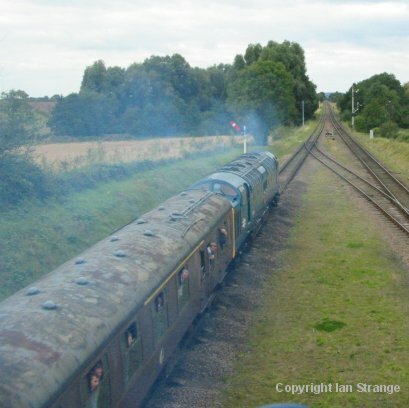 As the Deltic nears, its engine note dips for the 2nd field-divert. A northbound EMU passes, and then the Deltic charges passed at 2128 on its way to Kings Cross. It’s then heard roaring into distance downwind. 4 - a) 55022 idles in Nuneaton station over 2 miles away. - b) 55022 sounds its horns. A northbound Pendolino sounds its horns as it over-takes the Deltic and then passes by. 55022 builds up to full power and passes at 1503 on its way to Euston, on the return positioning tour following yesterday’s outing. It’s then heard downwind, the note dipping twice before the field divert holds. See front cover photo. 5 - On a damp and blustery morning, 55022 is heard approaching. A sprinter heads downhill before 55022 passes on the "Heart of Wales" railtour at 1016hrs. 6 - D9016/D8 arrive at Matlock at 1124. An extra toot on the horn is given for the sound recordist by Deltic driver Chris Wayman. 7 - *D9016 in-cab at 1239 on a goods train standing at Rowsley. 31270 stands alongside in the loop. Chris Wayman revs the Deltic a tiny bit, and without any train movement, shuts off and states that there’s a brake stuck somewhere. We’re given the right-away again and we inch forwards with a squealing noise behind us and stop. A brake sticking somewhere? Right-away given, and we ease away with a loud squealing from behind before we’re asked to stop. A brake-van brake had failed to release. 8 - *D9016 in-cab. Departing Darley Dale (same goods train) at 1255. 9 - *D9016 rear-cab. Young Luke Wayman is now at the controls and we ease slowly back through Darley Dale at 1310hrs. 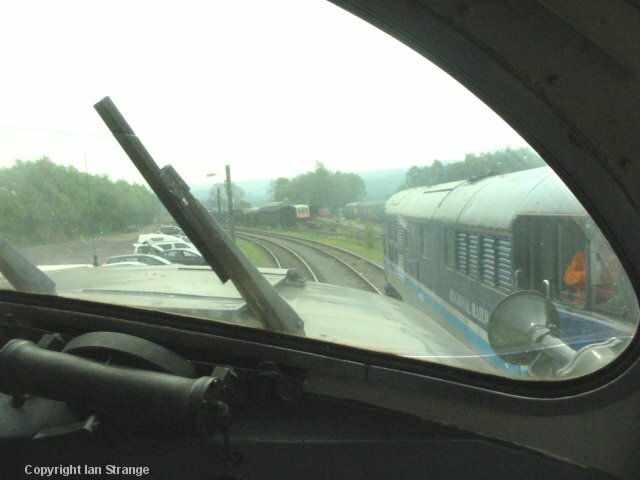 It was hot weather, and we had the doors and windows open, which let in the booming air-intake sound, reflected from an adjacent class 31 hauled train. 10 - D8/D9016 depart Rowsley on a passenger service at 1520hrs. 11 - After being uncoupled from the rear of an arriving train, D9016 pulls away smartly (Luke Wayman driving). Rowsley station, 1620hrs. 12 - After 9pm it is still light, on a fine summer’s evening. 55022 hot on the heels of a Voyager, opens up in the distance after a signal check, but eases off again before passing up the steep grade, at 2119, checked again. 13 - Heard from Quorn, 55019 (both engines running all that day) departs Loughborough in the distance at 1332. D6535 arrives from the south. 55019 slows for the station foot crossing and then accelerates passed non-stop at 1337hrs. 14 - Recorded from the over-bridge at Quorn, D8098 + 37314 arrive from the north. Then 55019 erupts from under the bridge at full power, at 1420 heading for Loughborough. 15 - a) 55019 runs round the stock at Leicester North. - b) 55019 stands next to the bridge and then backs onto its train. 16 - Just before sun-down, at 1733, 55019 eases away from Leicester North. 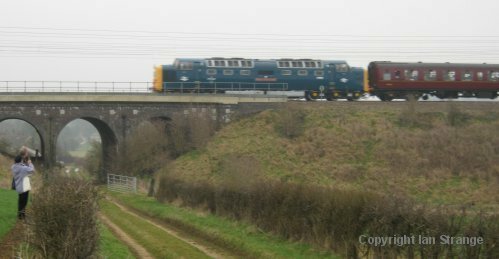 The Deltic emerges from under the bridge and then opens up and roars into the distance, easing off briefly for the foot crossing. 17 - 55022 is heard approaching from the north before being drowned out by light aircraft activity. As always, Deltic sound prevails and no.22 sweeps passed about 200 yards away. 18 - A beautiful bright June evening, with birdsong audible and hares running around the field (not audible). 55022 can be heard some distance away. Although delayed, and running slow-line, full power was maintained, hauling 12 coaches plus 57601. 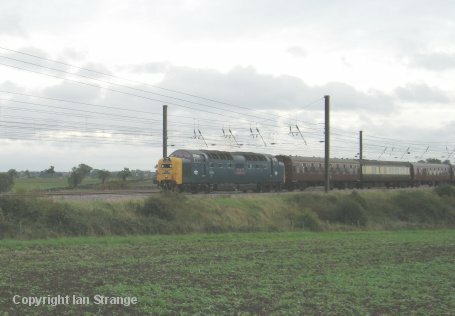 This sound is briefly interrupted by a southbound class 180, and then the Deltic drone goes on, and it powers by at 1950hrs. The tour, “Capital Deltic”, was returning to Preston from Oxford. 19 - At 2034hrs it is cloudy and almost dark. The only sounds are distant road traffic and the wind rusting the leaves. 55022 opens up in the distance, still to the south of Bromsgrove. 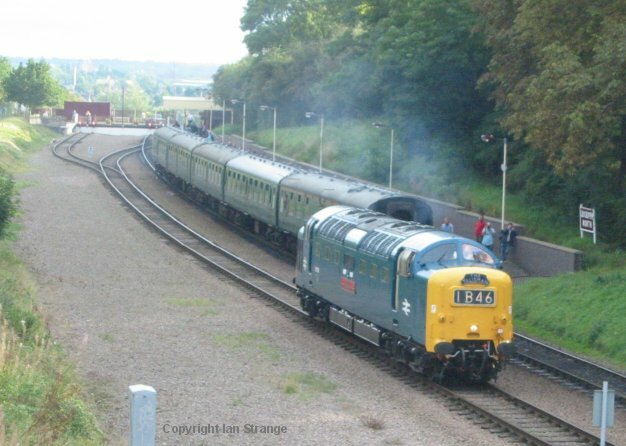 Its headlight is visible as it passes through Bromsgrove before doing battle up the 1 in 37 gradient with a 12 coach railtour ("Dorset Deltic Explorer"). It was returning from Weymouth to Crewe. There were no other people or other trains to interrupt this wonderful Napier music!